There are many religious, cultural, and family rituals & practices as well as readings, poetry, scripture passages and music that can be included throughout a wedding ceremony. Talk about it together with your fiance and decide which elements you would like to include in your ceremony. I will work with you and assist you each step of the way to ensure that you are completely satisfied with your wedding ceremony. Any custom can be celebrated in English or Spanish. Here is a list of wedding ceremony elements for you to consider. If you would like to add something that is not on this list, just let me know. For an elegant touch, consider a Rose Ceremony to the mothers of the bride and groom (or to anyone else you wish to appreciate and acknowledge). This is usually done at the beginning of the ceremony. The bride and groom can offer a rose to each mother after the presentation of the bride or they can give a rose at the beginning of the ceremony. Since this is your wedding feel free to present a rose in any way that feels right to you and your fiance. As an alternative when the bride initially walks down the isle, she can stop and present one rose or flower from her bridal bouquet to her mother (this can also include a kiss or hug). When the ceremony is over, the bride can repeat this gesture with her mother-in-law. After your wedding vows consider a Rose Exchange. The wedding minister or the maid of honor and best man can offer the rose to the bride and the groom at the appropriate moment. Often a rose exchange can go like this. "Bride and Groom, the wedding rings you just exchanged is an outward expression of your undying love and a public showing of your commitment to each other. Today, you are also going to receive another gift from each other (At this point two people whom you have previously selected will bring you each a rose). Roses have always been a symbol of love, and a single red rose always says, "I love you." So it is appropriate that your next gift to each other on your wedding day be a single red rose. Please exchange roses. In some ways it seems that you have not done anything at all. A moment ago you held one small rose, and now you are holding another. A marriage ceremony is like this. In some ways tomorrow is going to seem no different than yesterday. But in fact, just now, you have both given and received one of the most valuable and precious gifts of life -- one I hope you always remember. You have exchanged the gift of true and abiding love within the devotion of marriage. Bride and Groom, in remembrance of this day and as a reaffirmation of your love and of the vows you have spoken here today, please give each other a single red rose each year on your anniversary. In the best of marriages there are difficult times. There are times of hurtful words, times of neglect, times when we must wait patiently to be together again. Those may be the times when the words you really need to speak are difficult. I ask that you remember this moment and that when words fail you, that you place a single rose on your spouse’s pillow as a way to say, “I remember our vow,” and “I love you.” Let this exchanging of roses be the beginning of a lifelong tradition of unspoken love. The Unity Candle is a very traditional wedding event. If the wedding ceremony will take place in a windy environment, consider a sand ceremony, see below. In a unity candle ceremony, the bride and groom hold two lit candles (representing their separate lives, families and experiences before the wedding) and together light a center candle. In this ceremony the mothers of the bride (or any 2 people) each walk in holding a candle. They place each candle on a table in a candle holder. Each candle is then lit by the mothers. After the exchange of vows, but before the exchange of rings, the bride and groom each take one lighted candle and together light the center unity candle symbolically uniting their families and experiences into one. After the center candle is lit, the bride and groom blow out the candles used to light the center candle and place them back on the candle holder. The verbiage for this ceremony can be as follows or a personalized ceremony can be created for you. Bride and Groom, the two separate candles symbolize your separate lives, separate families and separate sets of friends, in other words, your lives before today. Lighting the center candle represents that your two lives are now being joined together as one. You may now pick up the lighted candles and together light the center candle. Bride and Groom, have chosen to affirm their love by the lighting of a unity candle. Every human being possesses a special light that burns within them. When two spirits, destined to be together, find each other, their streams of light flow together, and a single brighter light, goes forth from their union. Bride and Groom, by committing to one another today, you kindle the light within each other, and promise to do your best to always see that light within each other, to nurture and ten that flame in your partner as best you can, especially in difficult times, when this may be hardest to do. As you join your individual flames together and light the center candle, this will symbolizes the spirit of your union and the new greater flame of your marriage. As you do so, silently vow to tend the spirit of this union, and never forget that just as this union is made stronger by your strength as individuals, so are you as individuals made stronger by this union. You may now pick up the lighted candles and together light the center candle. The Blessing of the Hands. These are the hands of your best friend, young and strong and full of love for you, that are holding yours on your wedding day as you promise to love each other today, tomorrow and forever. These are the hands that will work alongside yours as together you build your future. These are the hands that will passionately love you and cherish you through the years, and with the slightest touch will comfort you like no other. These are the hands that will hold you when fear or grief temporarily comes your way. These are the hands that will countless times wipe the tears from your eyes, tears of sorrow and tears of joy. These are the hands that will give you support and encouragement to chase down your dreams. These are the hands that will lift your chin and brush your cheek as they raise your face to look into eyes that are filled with overwhelming love for you. “Today, this relationship will be symbolized through the pouring of these two individual containers of sand. One representing you Groom and all that you were, all that you are, and all that you will ever be, and the other representing you Bride, and all that you were, all that you are, and all that you will ever be. As these two containers of sand are poured into the third container, the individual containers of sand will no longer exist, but will be joined together as one. Just as these grains of sand can never be separated and poured again into the individual containers, so will your marriage be.” You may now each pour your sand into the center container. Bride and Groom, today you join your separate lives together. The two separate bottles of sand symbolize your separate lives, separate families and separate sets of friends. As you each hold your separate container of sand, it symbolizes your lives prior to this moment; individual and unique. Now as you blend the sands together, it symbolizes the blending together of your two hands, two hearts, and two lives into one. You may now each pour your sand into the center vessel. In Bible times, people understood the meaning of vows and keeping promises with each other at all costs. This was symbolized in something called, ‘The Covenant of Salt.’ Men wore a pouch of salt tied to their belt and when they made covenants, they would each exchange a pinch of salt, putting their grains of salt into the other’s pouch and vice versa. If a man would try to break his covenant, then the other would say, “Yes, if you can retrieve your grains and yours only from my pouch of salt.” Obviously, this was impossible because the grains of salt would all become as one when they were mixed together. Here is one sample of the Salt Covenant. Bride and Groom, our God is a God of Covenant (Promises) and is loyal as expressed in the Old Testament phrase, “The Lord keeps covenant for a thousand generations to those who fear Him.” ‘Covenant’ is the most sacred word in human speech. There are several types of covenant spoken of in scripture. Today, this relationship is symbolized through the pouring of these two pouches of salt, one representing you Groom and all that you were, all that you are, and all that you will ever be, and the other representing you Bride, and all that you were and all that you are, and all that you will ever be. As these two pouches of salt are poured into the third container, the individual pouches will no longer exist, but will be joined together as one. Just as these grains of salt can never be separated and poured again into the individual containers, so will your marriage be. The Coins or "Las Arras". This custom originated in Spain. Centuries ago a man would give his bride thirteen gold coins, a token of his pledge to support her. Some say the coins represent Christ and His twelve apostles. The act symbolizes entrusting the stewardship of all his earthly possessions to his new bride. Her acceptance signifies her promise to be a wise and responsible steward for the sake of the family. Today it is common for her to pour the same coins back into the groom’s hands representing a mutual commitment to provide for their joint needs. (The coins are then placed back into a pouch and handed off to the best man for safekeeping). In the actual ceremony, usually after the exchange of rings the minister asks for the coins. He then speaks of their significance and says a prayer. He then places them into the hands of the groom and asks the groom to repeat a promise. The groom then drops the coins little by little into the hands of the bride. The bride then repeats a promise and drops the coins back into the hands of the groom. The groom then places the coins into his pocket or gives them back to the person who brought them. It goes something like this, it can be in Spanish or English. "Bendice Señor estas arras que pone Groom en manos de Bride y derrama sobre ellos la abundancia de tus bienes. Amen". Entrega de las arras. Groom says, Bride, receive these arras: as a sign of God’s blessing and as a symbol of whatever I receive will always be shared with you. Bride says, Groom, yo recibo estas arras como prenda de la bendición de Dios y signo del cuidado que tendré para que no falte lo necesario en nuestro hogar. In this tradition a lasso or rope is placed by the minister around the bride and groom's shoulders in the form of an "8" (the infinity symbol). The lasso is usually placed by two of the bride and grooms sponsors (or compadres) after the exchange of vows to symbolize their everlasting union. The couple wears the lasso throughout the remainder of the service. The lasso can be made of rosary beads, white ribbon, orange flowers, fabric, silver, crystal or elaborately painted wood. There are short and long versions of the custom of the veil which symbolizes the union of the bride and groom. Normally two sponsors are called to place a veil over the bride and grooms shoulder as a prayer is said. "Lord, with this veil, which represents this couple's union and mutual surrender to each other, may you always protect (bride and groom) from any harm and strengthen them to provide continuous moral and spiritual support to each other and their children. May they remain loyal helpmates to each other as they carry life's burden with joy". The veil remains on the shoulders of the bride and groom until the sponsors are called again to remove it. There is also a custom where the bride walks in (along with her father or family member) with a veil. She keeps it on until the presentation of the bride. This is when the minister asks, "Who presents this woman in marriage to this man?" After the father responds with "I do", the father pulls the veil back and give the bride a kiss. The veil remains off throughout the entire ceremony. Two sponsors are called to place a cord over the shoulders of the bride and groom. A prayer is then said. Later in the ceremony the sponsors are called again to remove the cord. The prayer is similar to, "Lord, with this cord, may the bond of love and friendship uniting (bride and groom) grow stronger over the years. May they remain united to you all their lives knowing, loving and serving in each other and the community". Communion brings a spiritual aspect into a marriage at the inception of the marital relationship. The origin of Communion comes from the New Testament as recorded by Matthew when Jesus broke bread and shared the cup with His disciples just prior to His betrayal and arrest in the garden of Gethsemane. It symbolized the breaking of His body and shedding of Christ's blood which was soon to take place on the cross. To include this ceremony in a wedding establishes a family altar in the home where the couple is symbolically demonstrating their desire to recognize Christ as the head of their home. (The minister would serve a small loaf of bread and juice or wine in a goblet and allow the couple to have a few moments to pray over their new relationship. He could then also pray over them, if desired. This would take place after the pronouncement). Butterfly Release (feel free to modify wording). Today, we release a butterfly as a symbol of new beginning and life. We celebrate the resurrection and rejoice in the wonder, and reconnection. As it glides away in the air, and flutters among the blossom there, and stops to rest on a flower or two, and takes a drink of the morning dew, we remember that there is nothing too small that our faith in Christ should ever stall. Tree Planting (feel free to modify wording). The Bride and Groom will now take part in a Tree Planting Ceremony, to symbolize the roots of their relationship, and the continued growth of their love, as they become husband and wife today. Love is the essence of human experience and emotion. It is the root of all and everything we, as humans, are. Love richens our experience, and fills our lives with meaning. It gives us a firm base from which to grow, to learn, and change. Let your relationship and your love for each other be like this tree you plant today. Let it grow tall and strong. Let it stand tall during the harsh winds and rains and storms, and come through unscathed. Like a tree, your marriage must be resilient. It must weather the challenges of daily life and the passage of time. And just like the tree you are planting, marriage requires constant nurturing and nourishment. Bride and Groom, would you please plant the sapling? Remember to nourish each other, with words of encouragement, trust, and love. This is needed on a daily basis so you each can grow and reach your fullest potential - just like this tree. Bride and Groom, would you please water the sapling? Let this tree be a reminder of this beautiful day when you two became one. If you have a favorite Bible verse that you would like to be read aloud during your wedding ceremony make sure to let me know. For the most popular list of wedding ceremony scriptures click here. This is usually done immediately following the Introduction of the couple when the Recessional music begins and the bride and groom begin walking down the aisle. An alternative is the moment the couple kisses. The dove is the symbol of love and peace. The significance is that doves mate for life. Honoring (recognition) of children, parents and/or deceased family members. Poem reading by a friend or family member. Special encouragement or a word of encouragement from a friend or family member. 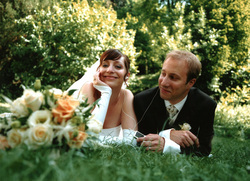 Your wedding ceremony can be simple or involved, short or long, it’s totally up to you. You can include as many of the cultural, traditional, religious, and family rituals that you desire. Take your time and feel free to be as creative as you like. To begin, fill out the Ceremony Details Form, give me a call at: 626-217-2504 or send me an email. Send to: Nick at TreasuredCeremonies dot com.